The pair, who met at a concert in their home city in 1997 and worked together under the name Bad Meets Evil, have announced that they've put aside their differences and are bringing out an EP of new material in June. 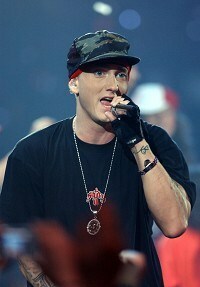 One of the songs they recorded in the late 1990s, called Bad Meets Evil, appeared on Eminem's major label debut, The Slim Shady LP. According to a statement from Interscope Records, the rappers pursued solo careers after they became embroiled in a feud. In the years since, Eminem's career has reached superstar levels with tens of millions of records sold and Grammy and Academy Award wins. Royce da 5'9" also has seen success, but on a much smaller scale, with three of his albums charting in the R&B/hip-hop category. "Royce and I started hanging out again and inevitably that led us back into the studio," Eminem said in a statement. "At first we were just seeing where it went without any real goal in mind, but the songs started to come together crazy, so here we are." Royce da 5'9" said he was "excited to see this project come to fruition considering the long lapse in time between when we worked before and now." The new material will be released in June 14.